Scenic and whitewater raft trips, and guided glacier adventures since 1975. 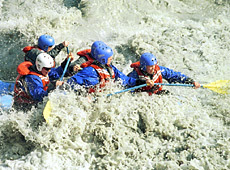 On the Kenai Peninsula and near Hope, AK; we offer daily whitewater rafting on Six Mile Creek. This is one of the premier whitewater trips in North America. Our trips in the Mat-Su valley are located near the Matanuska Glacier where we run scenic and whitewater raft trips for most ages and guided glacier hikes, ice climbing introduction on the Matanuska Glacier, Alaska's largest road accessible glacier.